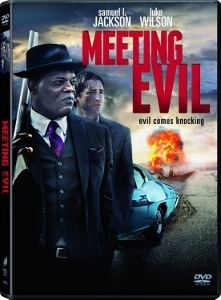 Article first published as DVD Review: Meeting Evil (2012) on Blogcritics. Could the troubled housing market lead to murder and mayhem? The people behind the film Meeting Evil (based Thomas Berger’s 1992 novel of the same name) seem to think so. 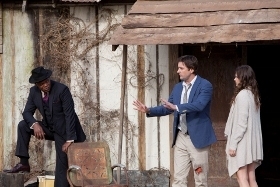 The film, starring Samuel L. Jackson and Luke Wilson, is set squarely against the backdrop of the U.S.’s fading economy. However, this film is not an exploration of the current financial crisis. It is a B-movie thriller where the good guy can’t get away from the menacing bad guy no matter what he does. The film fails to rise above the confines of its generic thriller plot, but it is not without a handful of fun moments and some genuine thrills. I have to imagine Samuel L. Jackson gets plenty of scripts to read. What attracted him to this dime-a-dozen, straight-to-video fare is beyond me. 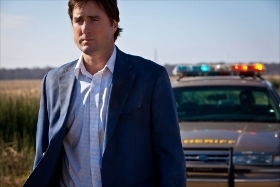 This film also makes me wonder why Luke Wilson doesn’t get better film roles. He showed a lot of promise in films like Bottle Rocket and The Royal Tenenbaums, and he’s been in some commercial successful stuff like Old School and Legally Blonde. However, his filmography is filled with films like Vacancyand Bad Seed, just to name a couple, so it’s not a huge surprise to see him in this one. Wilson plays John, a man having just about the worst day of his life, and that’s before he even meets the sociopathic killer about to knock on his door. John is a real estate agent who has just lost his job, has a stack of unpaid bills, is about to lose his own house. He has an icy relationship with his wife Joanie (Leslie Bibb). To top it all off, it’s his birthday. After his wife leaves to take the kids to the park, John finds himself alone in the house. There’s a loud pounding knock at his door. John opens it to find Richie (Jackson) on his doorstep. Richie says his car has stalled and wants John to give him a push to get it started again. It becomes clear rather quickly that Richie means to kill John, but at the last second he changes his mind. Instead he convinces John, who is unaware of the aborted attack, to get in his car. It’s no spoiler to say that Richie is not a nice guy. He seems pretty weird from the get-go. John becomes his unwitting accomplice as Richie terrorizes the town. In simple terms, Richie is evil, while John is good. It’s up to John to stop the evil-doing and get his life back. The problem is, John isn’t all that good himself. He hates his life, cheats on his wife—neither of them seems to care one iota about their two children. That’s actually kind of the point of the movie, but it’s never explored. Richie tells John they are a lot alike, but John is still portrayed as an everyman. Given the circumstances, it’s hard to sympathize with him or his wife, but the film never gives us any other choice. Meeting Evil was not without potential. Jackson gives a no-holds-barred performance as the unrepentant Richie. He has plenty of darkly funny lines in the first act of the film. Richie expects common courtesy and he lets people know when he doesn’t feel he’s received it. If the dark humor had kept going through the entire film, it might have been a better movie. Wilson is a good reactionary actor, and the two play well off each other when they first meet up. Unfortunately the offbeat humor is dropped in favor of genre clichés, leading to the inevitable good guy vs. bad guy showdown. A final twist puts an intriguing spin on the situation, but it’s just too little, too late. The DVD offers no special features. I would have actually been curious to get a little background into the making of this film. I have to wonder if the script was reworked to conform a little more to the standard psycho-killer template, which would explain the shift from campy dark humor to straightforward thriller. Overall it’s not a terrible movie, but is probably only worthwhile if you are a fan of Jackson or Wilson.